This month’s theme is “Sakura & Matcha.” I can’t wait for spring to arrive, so I’m excited about these fresh, springtime flavors! 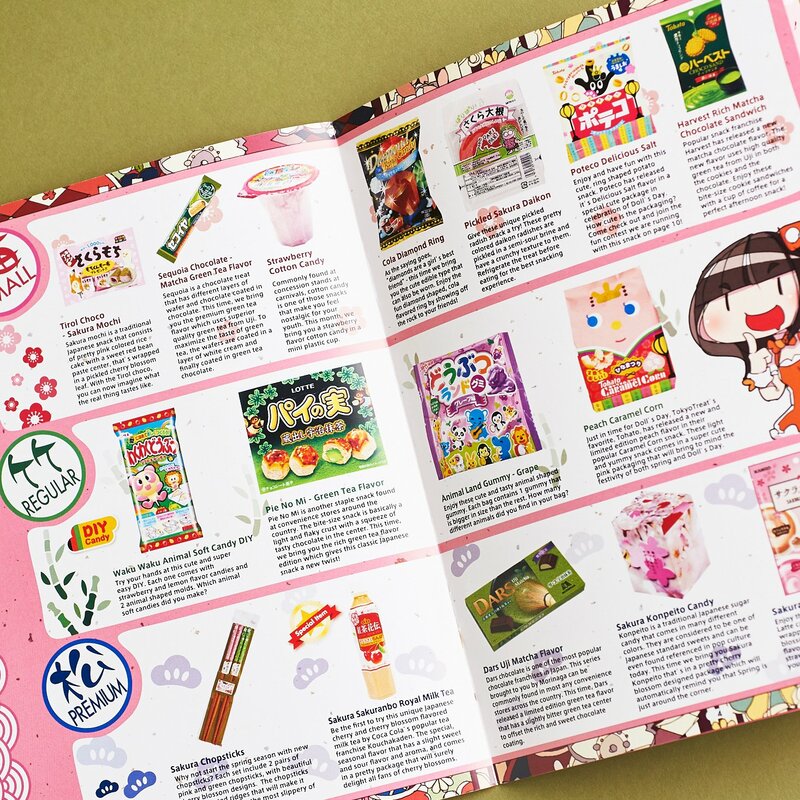 Every month, this box includes a really awesome “magazine” talking about Japanese culture, as well as the items inside the box. Here’s the product list for each of TokyoTreats three boxes. This review is for the small box, which is the top line. The items in those larger boxes sure are tempting, though, aren’t they? There are so many pretty pinks and greens in this box (not just in the packages, but in the snacks, too). These pale pink squares have a chocolate exterior and a sweet red bean paste center. I’ve never experienced sakura as a flavor before, but I really loved what it brought to this candy. The taste is somewhere between berry sweetness (it reminded me more of strawberry than cherry, weirdly enough) and the kind of floral flavor you’d get from a rose macaron or a floral tea. To put it simply, it tasted very much like spring! The bean paste in the center was kind of like a softer gummy candy (which those who know me will know I’m not a big fan of), but the mild, almost brown-sugar-like flavor dissolved nicely in with the not-overly-sweet chocolate. I’m a HUGE fan of matcha flavors. Probably because you can’t find those flavors in the states so easily, getting matcha flavored items in this box always feels special and exciting. This candy bar has a texture on the outside that makes it look like the stalk of a plant. The outermost layer of chocolate is infused with matcha flavor (hence the green), but there’s also milk chocolate on the bottom, some kind of white chocolate inside, and a layer of matcha between two wafers in the center. The wafers give the bar a great crunch. Because matcha has a light, bright, green tea taste, this bar wasn’t super sweet or rich. But I love that—the bar was just enough to satisfy my sweet tooth, but I didn’t feel like I needed something to wash it down in the way I might with a richer, bolder candy bar. Strawberry Cotton Candy – Value $2.00? This item might not fit the sakura or mochi flavor palette of the box, but nothing captures the dreaminess of a warm day like cotton candy! It was so fun pinching off little puffs of this pink confection. Its strawberry flavor is more sugary than anything, but that’s not a complaint! I really enjoyed getting this fun, nostalgic treat. Cola Diamond Ring – Value $0.83? Speaking of nostalgic treats, check out this ring lollipop! I couldn’t find this exact item online, so I linked to something similar. I used to love these in elementary school. It definitely brings back memories popping this plastic accessory on my finger and enjoying my lollipop hands-free! The ring part bends a bit so that it fit my adult finger. And most importantly, the candy was great! The info sheet said “cola”, and wow, does this live up to that! The candy really does taste like sipping on a sweet, subtly spicy, classic cola. Pickled Sakura Daikon – Value $2.00? I have a relatively daring palette, but when I saw this item in the box, I’ll admit I was scared. This bright pink puck looked more like a fancy soap than food! Just taking a guess here on price, since I couldn’t find one of these anywhere online! As it turns out, this treat is actually a vegetable. It’s a pickled daikon, which is a kind of radish. I was pretty timid about trying it—I avoided it while it sat in my fridge for a few days (the box recommends it refrigerated). When I finally gave it a whirl, I was happy that it was less bizarre than I expected. It basically tasted like a pickle but with a denser, root veggie texture all the way through. “Sakura” is in the name they put in the info booklet, but I didn’t notice that flavor so much. Poteco Delicious Salt – Value $1.13? “Delicious Salt” is how I’d describe most of my favorite snacks, so I was eager to try these! I love the simple, colorful, quirky design of the bag! I couldn’t find this plain flavor online, so I linked to something similar. These little loops actually have a hearty potato chip taste to them. They’re crunchy and light and not too distinctly salty, in spite of their name. Most importantly, they are so much fun to pop on your fingers! Instead of scooping handfuls out of the bag, I kept poking my fingers through these hoops and pulling out a handful of “rings”. Harvest Rich Matcha Chocolate Sandwich – Value $2.00? The last item on the list was actually my favorite. This little bag is around the size of a snack bag of chips. Inside, there are small but satisfying sandwich cookies featuring my beloved matcha flavor! This was another one that I couldn’t find online, so I’m taking a guess on the price. The cookies are about an inch in diameter. They’re great one-bite delights. The basket-weave cookies are crispy and lightly sweet, like biscuits. Best of all, though, is the green matcha cream filling that the cookies are sandwiched around. It’s smooth and very sweet. There are sugar crystals sprinkled on top of each cookie, too, which makes things even tastier. Strangely enough, as I was eating these tea-flavored cookies, I was thinking how good these would taste with a cup of coffee! Verdict: This springtime TokyoTreat box was really lovely. As usual, I didn’t enjoy everything in the box, but I did enjoy experiencing the diverse, unique flavors on display. The box of 7 items is $14.99, so I figured the items I couldn’t find prices for would have to be around $2.00 each. My estimations put the box’s value around $12.00. I’d be great if there was a bonus item or something else in the box to help bump that value up. That said, I know that, with this box, I’m paying for curation (these are hard-to-find items!). So with that in mind, I think it’s pretty fairly priced. If you’re a particularly picky eater, though, you might not get as much enjoyment out of this subscription! I’ve never seen cotton candy packaged in a cup like that. What a good idea!